People have been asking if Poptropica Adventures will be compatible with Nintendo's new 2DS handheld system, which is sure to be on a lot of holiday wish lists this year. The answer is yes! 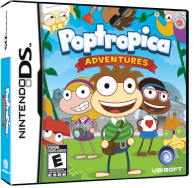 Poptropica Adventures works on any model of the Nintendo DS. So whether you're still holding onto that old DS Lite, or are expecting a 2DS this holiday season, we've got you covered. Poptropica Adventures is available from Amazon and other fine retailers!